I’m Codal’s resident technical writer. Because I work among a group of UX specialists, I often take note of practices that are common in other fields, yet are criminally underused in UX. Here’s one for you: modular documentation. Modular documentation was designed to streamline workflow, help with organization, and promote reusability. But its key benefit is that project stakeholders can access any piece of documentation at any moment—without derailing you from your work. No more sending documents, attaching files, or uploading documentation to project management systems. Simply notify the stakeholders that the modular document has been updated, and leave the rest up to them. What in the world is modular documentation? Modular documentation is exactly what it sounds like. 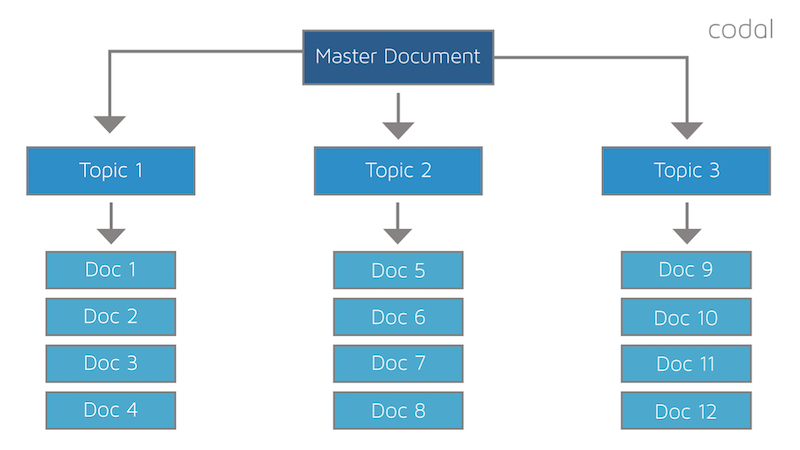 You create a central “hub” document that follows a modular architecture, linking out to strategically grouped “microdocuments.” The document groups are called “topics” and they’re centralized within topic folders. It may seem like these definitions are generalized and irrelevant to the UX industry. That’s because you’re right. This is an adaptable system—it works in technical writing, it works in UX, and it works in administrative environments. As a system, modular documentation can bring value to nearly any industry where documentation is frequently created and used. In the context of UX, modular documentation holds the key to unprecedented organization and communication. Why should you care? For starters, your stakeholders will love it. They’ll be able to view any piece of documentation with ease—and with proper context. Other teams, such as the development and visual design teams, will be able to easily locate any and all assets. Just give them access to the master document. If you work for a company with a huge design team, assets like logos, colors, and style guides may often be reused from project to project. Modular documentation was originally designed specifically for reusability. So, what does a modular framework look like? A graphic representation of the modular architecture hierarchy. We use Google Drive for our file organization—it saves time when sharing documentation, and it’s secure. You can use whatever you like—Google Drive, Microsoft OneDrive, a plain old folder on your desktop. At the end of the day, it doesn’t matter. 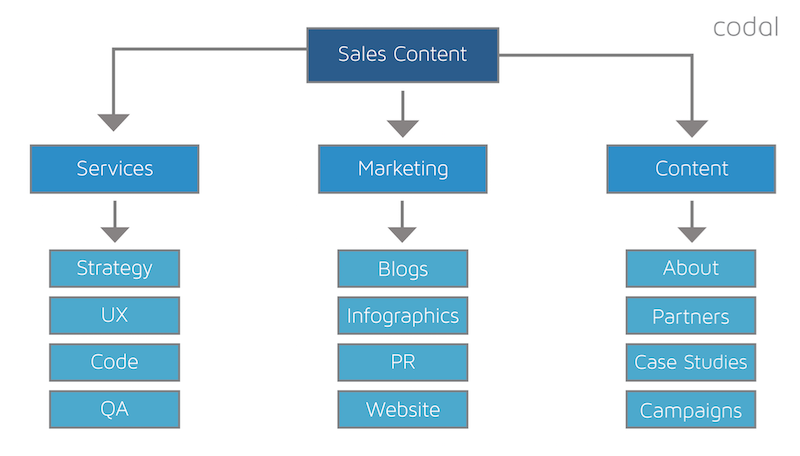 Next, provide a brief description of the project and scaffold out your link structure by determining your topics. Don’t worry about listing every possible topic at first—you can add or change topics as you develop your documentation. That’s the beauty of modularity. A partially complete master document. Now, create your topic folders within the master folder. In keeping with the above example, we’d create 4 topic folders: “Discovery & Planning,” “Research & Strategy,” “Conceptual Design,” and “Detailed Design.” Link these folders within the master document. Master folder containing 4 topic folders, and a master document. The topic folders you’ve just created will contain all manner of microdocuments: from sprint plans, to surveys, to user tests, to sitemaps, to interactive prototypes—anything relevant to the project. Quick refresher: A microdocument is a specific, focused piece of documentation. In the realm of UX, this means everything you create for the project, up to and including the actual designs, will become its own microdocument. Your master document is a living, breathing document. The list of topics and microdocuments will grow and shrink as the project progresses. Anyone with access to the master document will be able to find a specific microdocument, or view all microdocuments within a particular topic, depending on their needs. Structure your documentation in a way that makes sense to you (and to everyone involved). The rest is simply a matter of following the advice presented within this guide.